Born in the U.K. and raised near Montreal, Brian Walsh was a journalist and broadcaster before joining a major international company. For much of his thirty-year career he was involved in human resources, specifically training. While living in the arctic, Brian studied anthropology and Neurolinguistic Programming (NLP). Those experiences combined with extensive international travel prepared him for working with other cultures. He was then transferred to China where he served as his company’s General Manager. After his return to North America, he elected early retirement to further his earlier interest in NLP and hypnotherapy. He returned to formal study, and within four years had achieved his PhD His dissertation, which focused on accelerated learning techniques, inspired his passion and his book, Unleashing Your Brilliance. 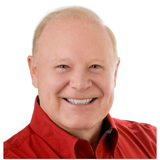 Dr. Walsh is dedicated to personal growth and enrichment through his workshops, teleclasses, audio and video products, and his many articles. He is a Master Practitioner of NLP, an acupuncture detoxification specialist, an EFT practitioner, and a clinical hypnotherapist. In addition, he has co-authored a self-help book with John Gray and Jack Canfield, 101 Great Ways to Improve Your Life (vol. 2). The Self-Confident Person - Cause or Effect? Intelligence is how well one can adapt to changing conditions.